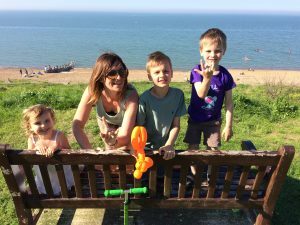 Hi everyone, my name is Niki and I am a mum of three to Archie 8, Baxter 5 and Luna 3. I am married to Chris and we all live in South London. We love going to the local parks, woods, museums and of course, reading! Luna’s favourite book changes all the time, but this week it’s ‘Oi Dog’ by Kes and Claire Gray. It’s a funny book that we enjoy reading together and Luna likes to shout out the rhyming words and loves the illustrations by Jim Field. It was great to see that this year the World Book Day chose the ‘Oi Goat’ book from the same series. I can’t wait to see which animals they are going to use in the next instalment. A Squash and a Squeeze by Julia Donaldson. I have been reading this book to my children for so many years now and I never tire of it. I love the story and illustrations by Axel Scheffler. Luna loves all the animals in the story and knows which order the animals enter and leave the old lady’s house. It also has an underlying theme to appreciate what you have. I had some favourite books when I was young and I remember books at different stages of my childhood. The Roald Dahl book I loved was the The Magic Finger, it’s actually quite a dark book looking back on it! As a toddler I remember Ted and Dolly’s Magic Carpet Ride and it is still at my parents house, an interactive book where you place the characters through the slots in the book landing in different places around the world – a book ahead of the times in the early 80’s! When I was older I liked the ‘Choose Your Own Adventures’ (which my eldest is now reading) and ‘Judy Blume’ books, which were like gold dust in our school library. ​What do you look for when shopping for a new book for your children? When shopping for new books I let the children decide, but I particularly like interactive books and my eldest boys like the Usborne ‘lift the flap’ books. I like them too so I can brush up on my knowledge! 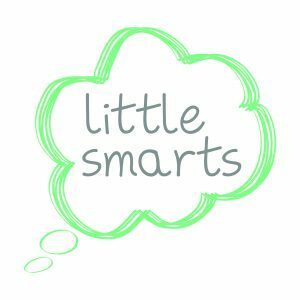 My business is little smarts, an educational, phonics inspired brand for children. I had the idea when my eldest struggled with phonics and had to have extra learning. In my day is was just A,B,C and ‘see and say’ and so I also wasn’t used to the phonics way of learning to read. I then decided it would be a good idea to create awareness of phonics on kids clothing. The little smarts colourful t-shirts and sweaters are UK designed and printed and I am hoping they will fire imagination and give children a head start at school when it comes to learning to read and write.